Learn how to recycle weeds, seashells, beer grains and more to improve your soil, save money and grow organic vegetables, herbs and fruit. 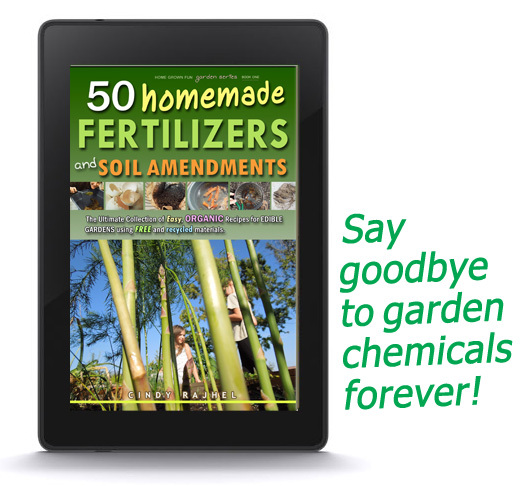 This 230-page eBook profiles many natural materials found inside and outside your home that can benefit your garden. Find out which edibles to use them on, why they might work, and at what stage in the growth cycle they are most effective. Discover why some fertilizers fail to give you results. You won’t apply the wrong nutrient at the wrong time again! Also get important warnings so you and your plants stay healthy. Alfalfa, banana peels, beans, beer (spent grains), borage, borax, comfrey, coffee grounds, compost, cover crops and green manures, crustacean shells, egg shells, Epsom salt, fish, grass, hair, leaves, manure (chicken, cow, goat, horse, rabbit, sheep), milk, nut shells, pet food, pine needles and straw, rainwater, rock dust, seaweed an kelp, urine (warnings too), weeds, wood and plant ashes and worm castings. For example, to mimic dolomitic lime, combine Epsom salt with eggshells. Dolomitic lime contains 4 percent calcium carbonate and 38 percent magnesium carbonate. Also use fish trimmings and leftovers from your meals. Any part of the fish works great, including bones and skin. Get a handy Quick Reference Chart showing which homemade applications work best for specific plants! References listed and linked in the back of the book take you to studies that support the information. Do you know which type of manure works best for pumpkins? For tomatoes? Manures from different animals do not perform the same. They contain different nutrients. Certain plants will respond better to specific manures. Find out which manure to use depending on what you plant. Do you know how to use manures safely? 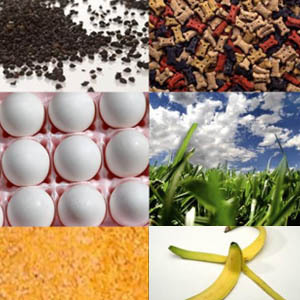 Get key warnings and procedures to ensure your food does not get contaminated. ~ How do plants absorb nutrients? 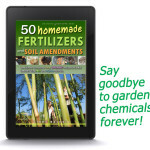 ~What is the difference between fertilizers and soil amendments and why is this important? ~WHAT is organic matter, WHY do we need it and WHERE do I get it? ~What are the pros and cons of synthetic and natural fertilizers? ~Are there easy and no cost alternatives to pH Tests? Step-by-step guide on composting with worms! NO expensive equipment or confusing instructions. Get worm castings fast using simple tricks of the trade. Our eBook consistently rates in the the top 10 on all of Amazon in the West Region for all Gardening and Horticulture eBooks! As of April 6, 2019, it is ranked 414,576 on the Amazon Best Sellers, Paid in Kindle Store list. But you can purchase here as a .PDF instead and get an instant download.